Today I had the opportunity to attend the Boston Design Center’s annual open house, “The Look” – albeit for only a couple of hours (babysitter constraints!). 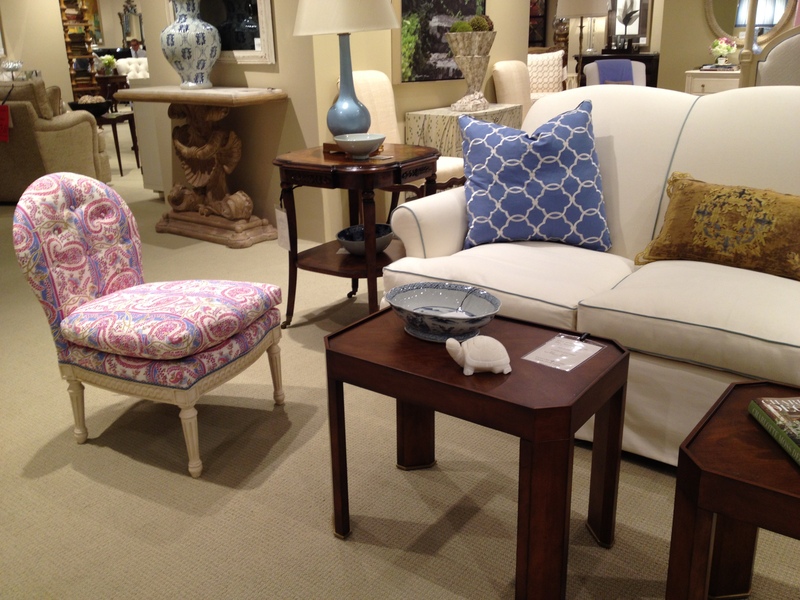 I spent some time perusing the showrooms, and introducing myself to folks as a newly minted member of “the trade.” During my abbreviated visit, I had my radar up for family-friendly furnishings, fabrics, and accessories. First stop was Grange. 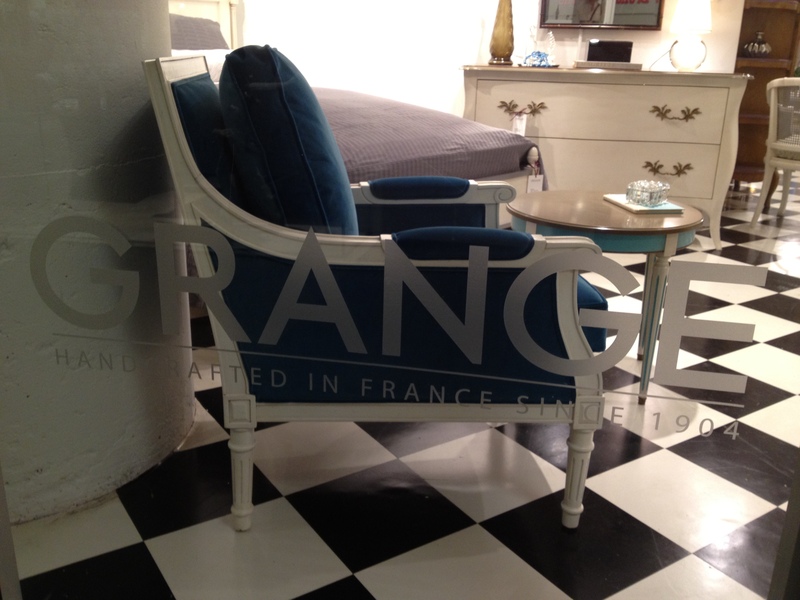 I love this place – modern spins on traditional French furniture (made in France); the showroom is fresh, youthful and sophisticated. 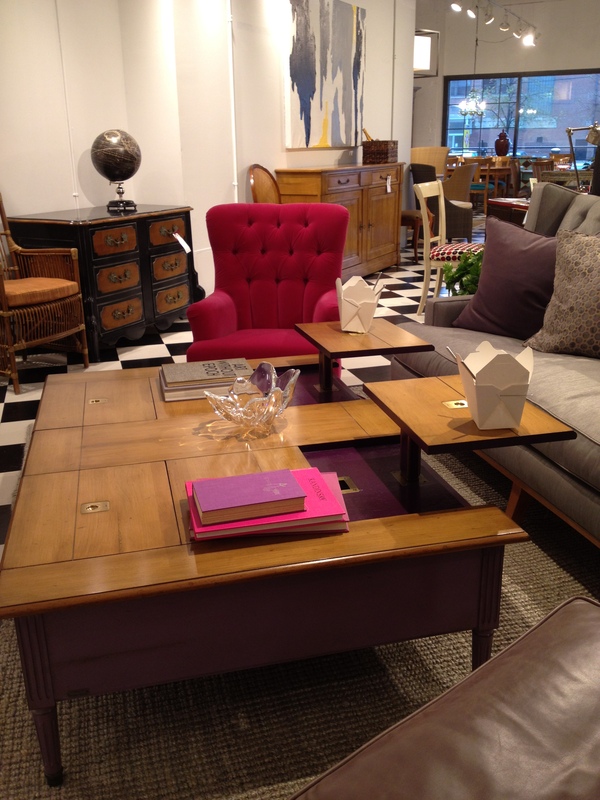 If you like to eat dinner in your family room while watching TV, this coffee table is for you! Panels on four sides lift up and out to keep your food and drink at a comfortable distance and level, and you don’t have to do gymnastics to keep that stretchy cheese from your pizza from meandering onto your pants, or your furniture. When you’re done, just slide the panels back to flush! A lot of designers dislike sectionals. I happen to really love them. I’ll save that diatribe for another post :). 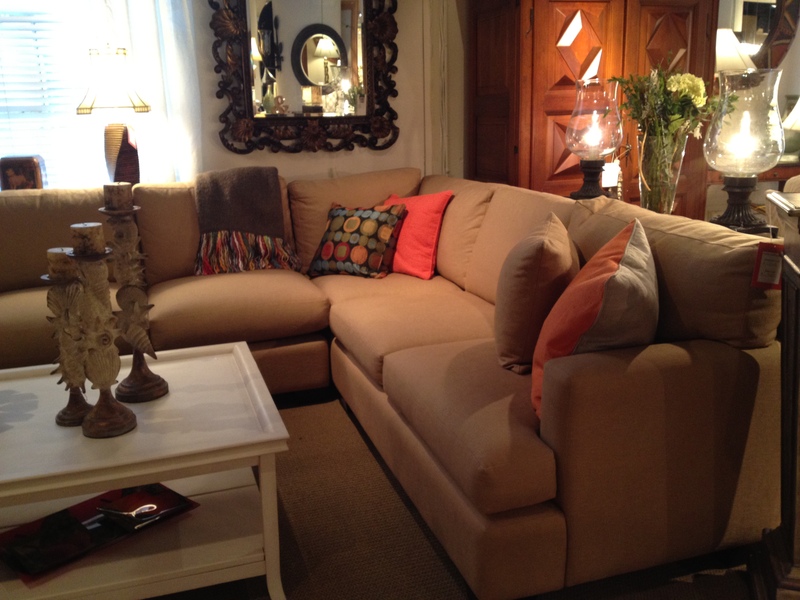 What I liked about this one, from Lee Industries, at Grand Rapids Furniture, is the fabric. It’s basically the color of dirt. Which means it will do an amazing job at concealing dirt! This is also a good quality to look for in an area rug or carpet (and why I am so fond of sisal rugs). 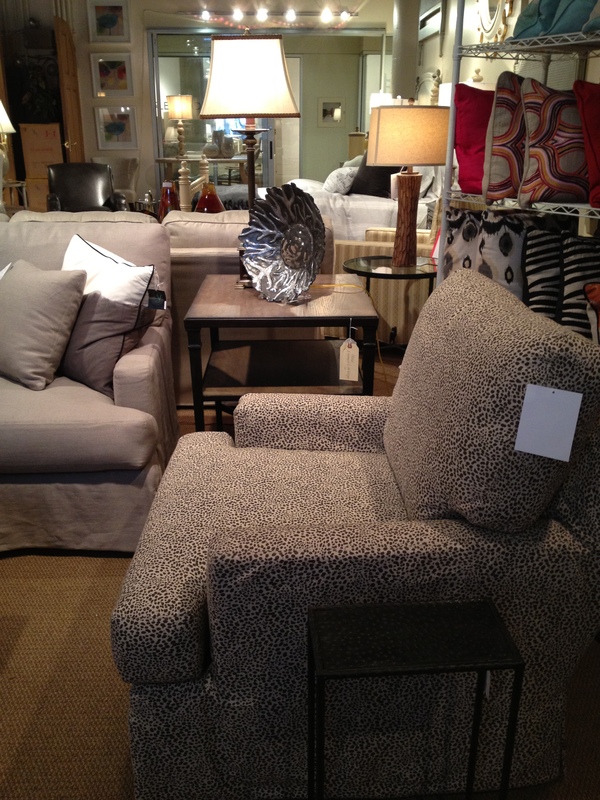 Here’s a tamer version of an animal print (I’ll be here all week…) armchair that could blend in with almost any decor or color scheme – also at Grand Rapids. The smaller scale leopard pattern looks interesting, gives the impression of texture, and best of all, will also work hard to hide blemishes and stains. No special family-friendly qualities to speak of here, but I absolutely LOVE these mirrors at Grand Rapids, and had to share. 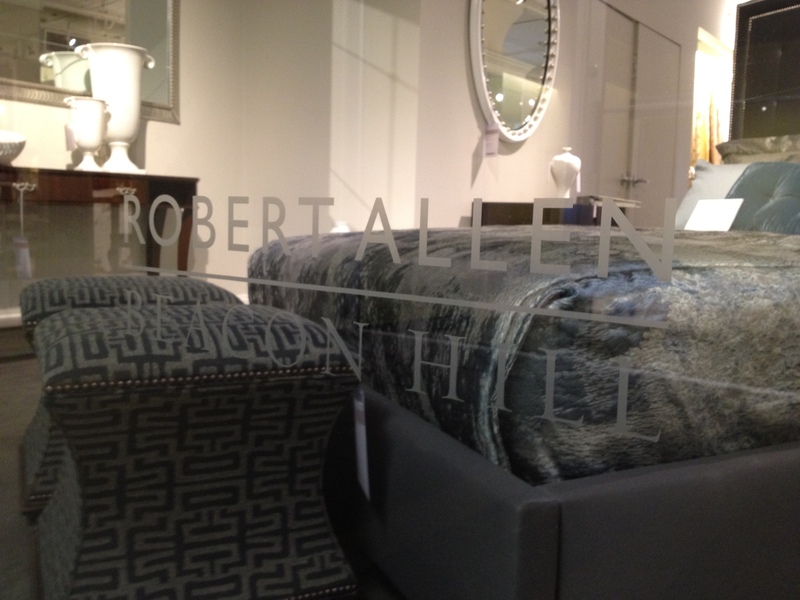 My next stop was Robert Allen – a veritable wonderland of fabrics of every conceivable type and use, and at a wide variety of price points. Those of you who have been reading Interiors For Families for awhile may have picked up on the fact that I have a thing for DwellStudio. 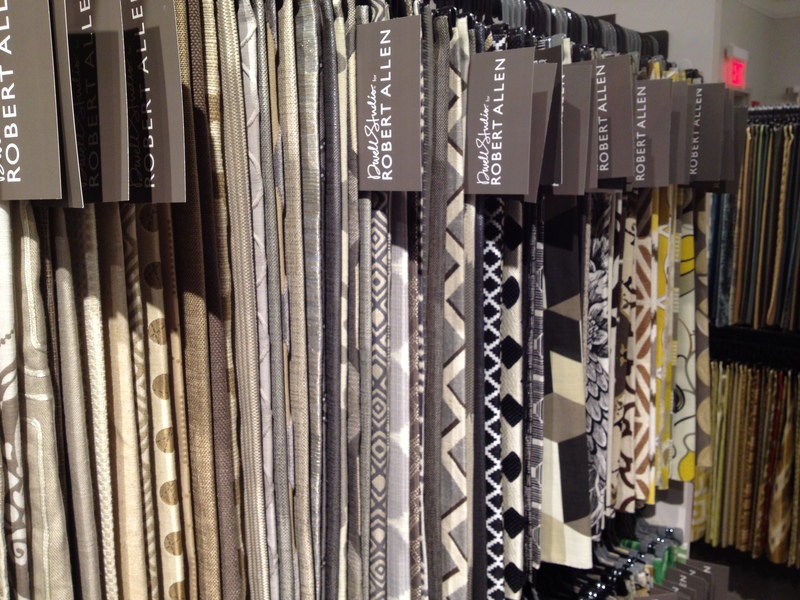 They produce a line of fabrics for Robert Allen that I absolutely adore. 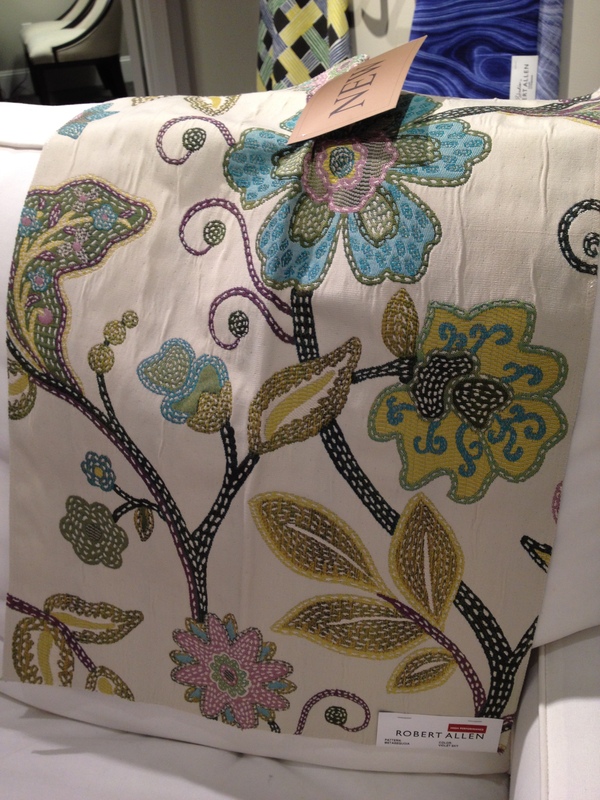 I found this great new large scale modernized Jacobean fabric – beautiful, no? It’s Metasequoia, in the Violet Sky colorway. Here’s the best part, though – it is classified as “heavy duty” at 30,000 double rubs, has a Teflon finish, and can be cleaned by you, at home, using water based cleaning products. A truly family-friendly fabric with style to spare. 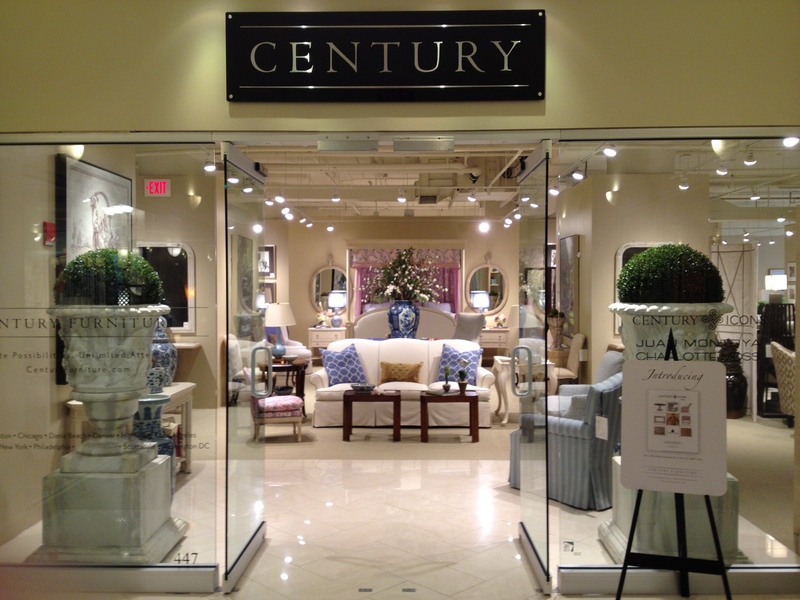 After I finished ogling the racks and racks of fabric samples at Robert Allen, I headed over to the Century Furniture showroom, where I happened upon some unexpected finds. 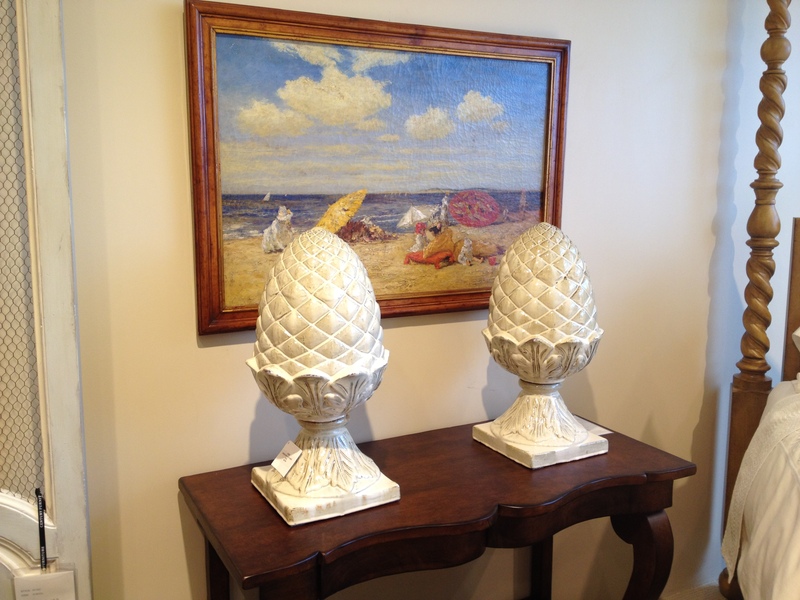 Loved these pineapple finials – a great addition to a foyer table or dining room sideboard. It’s the universal sign of hospitality, and an important part of the identity of this blog and my business (more to come on that later!). How cute is this little “junior” slipper chair, cozied up to an otherwise grown-up living room set-up? A truly accessible piece of furniture for kids in a main living space that doesn’t compromise on style – a thought-provoking concept. 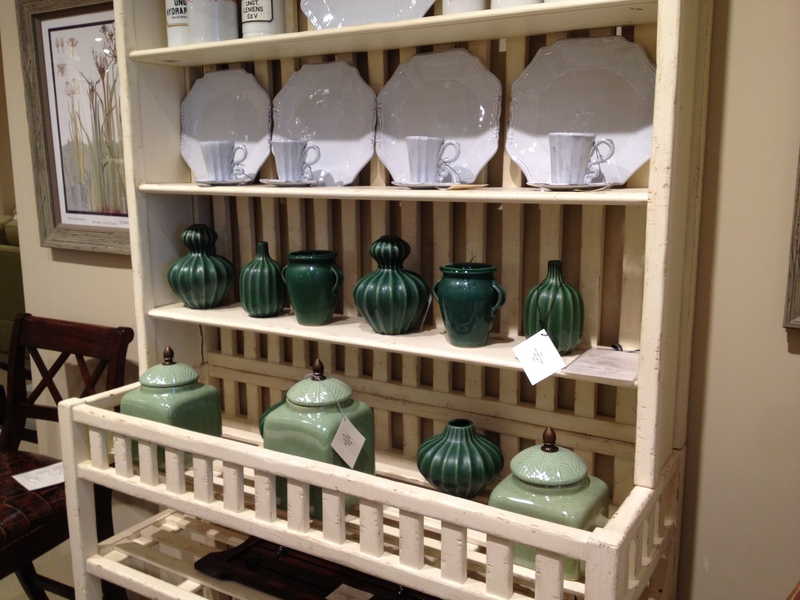 Still at Century Furniture, I was drawn like a moth to a flame by this simple but stunning display of green vessels and white porcelain place settings. It’s more about the color impact than the arrangement of the pieces, in this case, but this is giving me ideas for my own house. I’d love to know if you think any of these design solutions would work well in your home, and with your lifestyle. 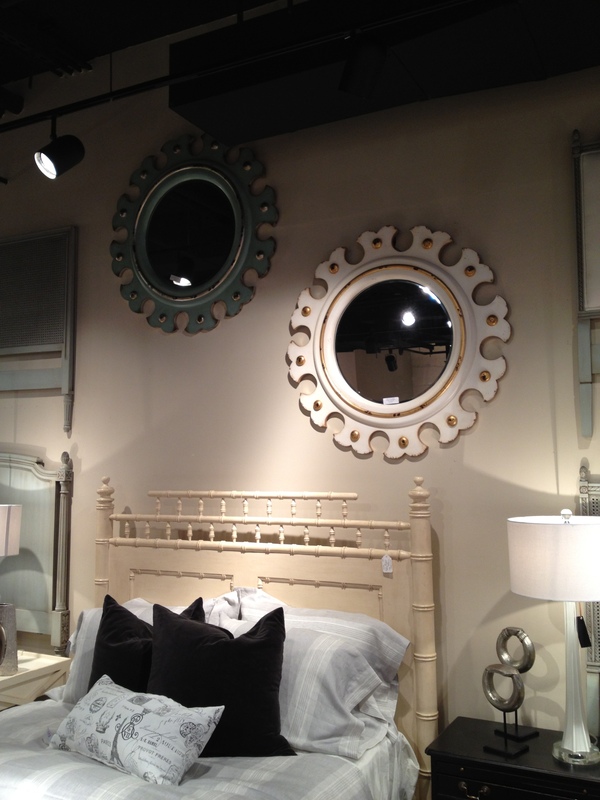 And I hope you enjoyed this peek into the Boston Design Center, as seen through my own lens of family-centered design!